So how can companies get started and set up a successful ecommerce business? What are the areas to look into before entering ecommerce? Let’s take a closer look at the fundamentals. It’s obviously important to have a strong business plan that outlines the strategy, markets, budgets, revenue targets, buy or build decisions. Without a proper business plan, companies will struggle with convincing internal or external stakeholders to buy in on the ecommerce plans. I previously worked with a brand who stated they wanted to achieve 20% of their overall sales via ecommerce channels by 2020. This is definitely a challenging goal considering that the ecommerce market average in ASEAN makes up only 1% for retail but still plausible as a vision supported by a growth strategy. If the internal expertise lacks the knowledge to develop a business plan, there is always the option to work with the usual consulting companies. But rather than going down this pricey path, keep in mind that an end to end ecommerce service provider has the capability to consult and perform all the legwork. If you intend to draft the business plan by yourself, plan ample time to conduct market research before making decisions. One of the most overlooked items when venturing into ecommerce is how to attract and keep the right people. Many companies will either use existing staff to run the online division or worse, add an additional workload on top of the current staff’s responsibilities. Going into the ecommerce business isn’t a light endeavour and requires focus so a company’s first steps need to be strong. If you plan on using existing resources, there is a risk of upset employees wanting to leave. 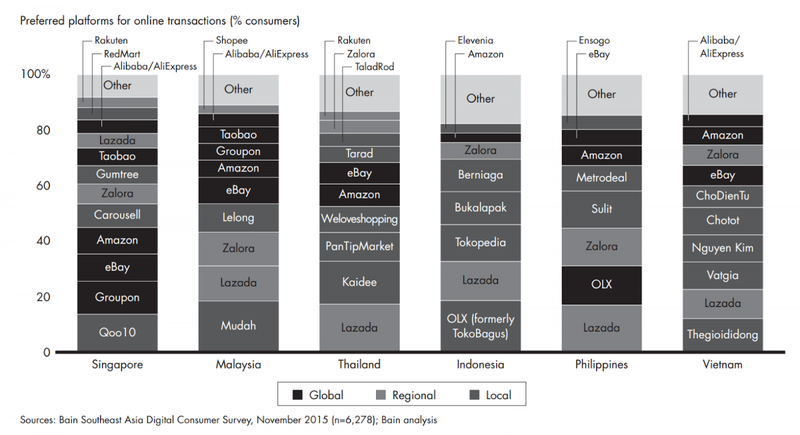 Ecommerce is still fairly new in ASEAN so there is an overall lack of ecommerce experience in the market. This has led to inflated salaries and job titles so it isn’t seldom to find Vice Presidents and Directors with only a couple of years of experience and well under 30. A CEO commented once that he doesn’t mind offering big titles to attract young people. I agree to a certain extent but at some stage, these VPs, Heads and Directors will compare themselves to their counterparts in the B2B world and ask for more compensation. In the traditional B2B environment, titles take much longer to earn, which explains why the average age of a Director is usually 10 years greater to his counterpart in a “new age” company. But be aware that the experience is much different. I don’t know how many times I interviewed Account Directors and Managers who didn’t know the difference between Revenue, Gross Margin and EBIT. Don’t assume certain titles equate to in-depth knowledge of certain areas. The ecommerce talent pool is primarily made up of Millennials – “a person reaching young adulthood in the early 21st century” according to Google. They grew up in a socially-connected and fast-paced environment and it’s evident in their CVs. Millennials hardly stay with a company for over one year. So integrating these types of candidates with your current workforce may be a challenge. There is obviously not a one size fits all answer but first decide whether it’s possible to groom in-house rather than hire. Do you have a great product you would like to sell online? Great, now the question is which sales channel will you use? If you have an easily recognizable brand, you may consider selling only via a brand.com website. The obvious advantages are that you don’t need to pay a marketplace fee, you have complete control over the look and feel and the consumer data is yours to further optimize your brand experience. Now, will the traffic on your website convert to significant GMV? In many cases, brands decide to have multiple sales channels that range from popular chatting apps, marketplaces, deal and price comparison sites, social networks, etc. to increase online sales. But companies have limited budgets and need to optimize marketing spend. 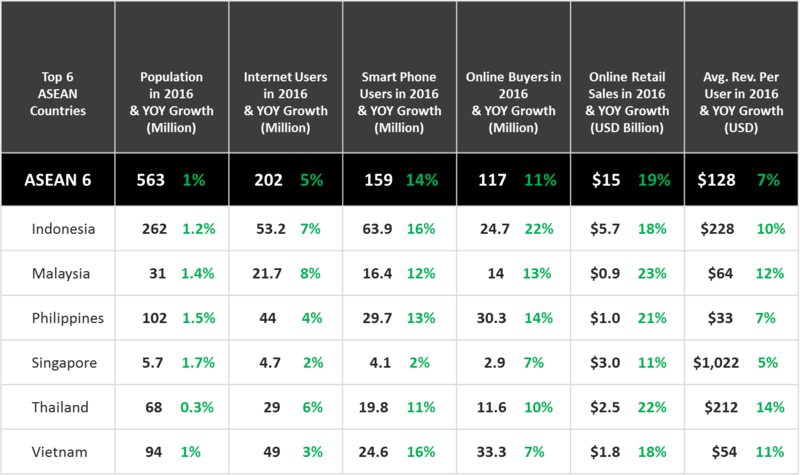 These are a few popular platforms preferred by respective ASEAN markets. Adopting a marketplace strategy, for example, isn’t simply deciding “I would like to sell on Lazada”. If you only connect to one then you might lose out on the sales opportunity on others in other markets. Evaluate first the sales channels to GMV ratio and start with the most popular marketplace before branching out your products. Store Management is essential for any brand – take for instance a world class product being sold on a marketplace. If the Store Manager takes a random picture of the product and couples it with a mediocre description, interested buyers will doubt the authenticity or have trouble finding it because the key search terms are missing. The negative impact on the brand’s value is also to be considered. Proper reporting and business intelligence will use previous sales data to better optimize product performance and foresee the return of marketing spend. A Store Manager will also use this data to suggest promotions and pricing strategies grow GMV over time. Coming up with the right supply chain strategy can be tricky because it needs to be flexible enough for modification over time. aCommerce encountered a brand driving a centralized distribution strategy out of Singapore for other ASEAN markets. It worked when order volumes were low but wouldn’t scale in certain countries, the main reason being customers in Indonesia had to wait a week for orders, didn’t offer a cash on delivery (COD) option and were asked to pay around $7.00 for delivery. This led to poor demand in Indonesia and the country never saw more than 100 orders a month. Our client decided to change the model and use a local solution we built and are now seeing around 1,200 orders in hardly been possible with a centralized model. Can the current tech infrastructure handle larger ecommerce transactions in the future? Are there only small enhancements to be made to fit ecommerce? Do we have internal resources to support the change? Is the system able to handle/scale thousands of small B2C transaction versus a couple of hundred B2B orders? Can we cover the licensing costs? Cutting down costs is tricky. If today’s B2B operations require 20 operators to pick and pack 1,000 pallets/month, it might be 100 operators to pick and pack the same quantity since B2C order sizes are on package level. If it costs $100.00 per operator license, you would pay $10,000 in the new B2C model versus $2,000 in the B2B model. Aim for site licenses compared to user licenses. Another common mistake is made by companies who underestimate the resources needed to build their own WMS platform. Use the time and money to invest in well-known players such as Manhattan, SAP or other smaller providers that offer off the shelf products that can be customized to fit your company’s needs. The challenge between today’s B2B and future B2C operations is that the warehouse processes are completely different. In B2B, there are orders with high quantities and fewer SKUs (high quantity/low mix) compared to B2C with small quantities/high mix. In warehouse terms, this means that companies will need more pickers using pick carts in B2C compared to B2B forklifts. 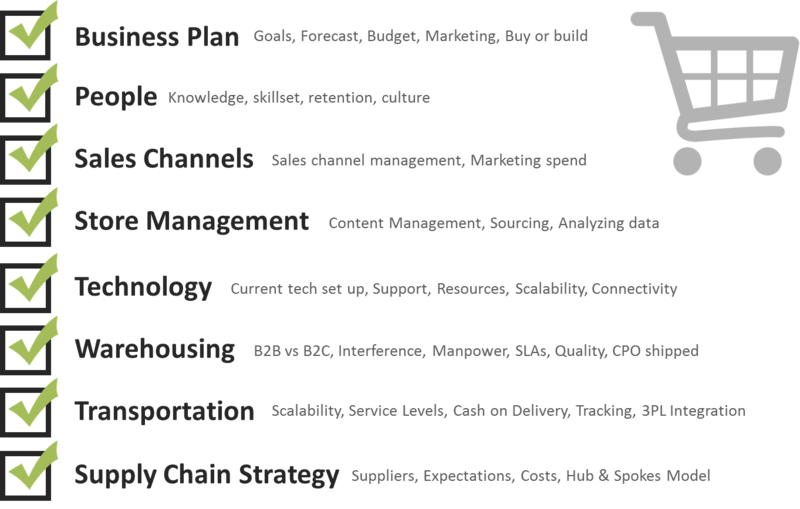 If you intend to run your own B2C operations then check whether it can be done out of your B2B warehouse. If not, does it make sense to rent a full warehouse and team and bear all the fixed costs instead of outsourcing? It’s important not to over invest at the start and instead test how the volumes are picking up to determine future investments. Working with a partner to manage your B2C operations will allow you to scale and leverage an existing workforce to reduce fixed costs. We have seen many clients who set up their own B2C warehouse infrastructure and end up utilizing only 50% of space and people. Outsourcing has become a trend as it provides the flexibility in terms of cost and there is no need to worry about staff productivity and space utilization. To avoid high inventory levels in the warehouse, some companies decide to go with in-store order fulfillment. How it basically works is that the WMS is linked to the point-of-sales (POS) system of the different stores and tracks inventory available in stores. If a customer orders online, the system will check in real time the closest store that carries the product and confirm its availability. The product will be blocked and a rider will pick it up at the store and then deliver it to the end customer. Operational costs are kept low because there is no need for an Ops team or additional storage space. But this is only scalable to a certain amount of orders, otherwise the store becomes a warehouse and impacts the offline consumer experience. Another way to avoid high fixed costs at the start is to set up a B2C area in a B2B warehouse, almost like an incubator. 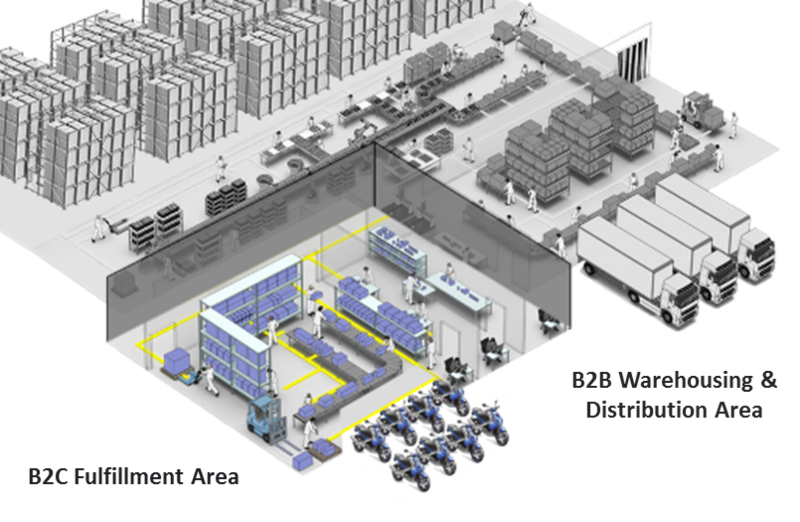 The segregated area will be replenished out of the B2B area but its operations will run completely separate on its own ecosystem and WMS. The only exchange will be between inventory levels with the B2B WMS. An essential component to any ecommerce business is transportation but is it best to invest in your own fleet or outsource? If you intend to build in-house transportation, bear in mind fleet utilization, scalability and sustainability. Only a few companies are able to build to scale an efficient fleet while many others end up outsourcing parts of it or giving it up all together. Why? Well, simply because last mile delivery is becoming more and more commoditized with better infrastructure, more competitors and better technology. Popular providers such as Ninja Van, Sendit or even DHL for domestic shipments are entering the market aggressively to gain market share and making the overall landscape more competitive. They all offer cash on delivery, which is essential in a region where majority of the population is unbanked and a dominant payments option like Alipay in China doesn’t exist. COD can be as high as 90% in certain areas, especially Tier 2 and Tier 3 cities across Indonesia and managing COD reconciliation can be a real pain. The recommendation would be testing shipments with local players or disruptive market entrants and assess them on service levels, COD capabilities, tracking and coverage. This will help determine whether you want your own fleet in Indonesia or collaborate with a specialist that handles multiple different 3PLs to provide the best service for last mile.